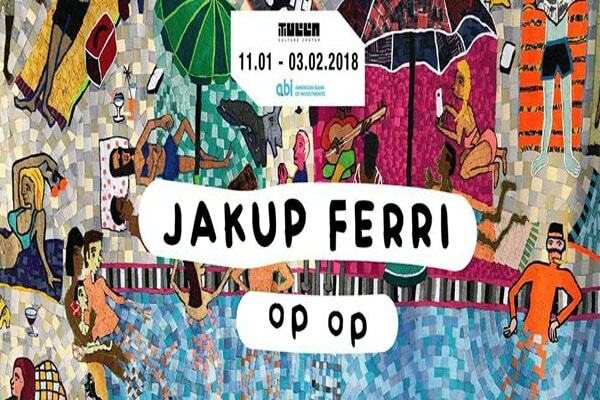 “op, op”, is a solo exhibition of Jakup Ferri. Ferri is known for his seemingly candid drawings on paper, glass and even on walls. He is part of a young generation of artists who as a result of international exhibitions and residency programmes, lead a nomadic existence. Ferri’s work is characterized by simplicity and directness, portraying people in their isolation, alienated from their surroundings. “op op”, will be showing Ferri’s most recent manufactured mosaic tapestry. For the technical side and the production of the mosaic, Ferri collaborated with Fatos Kabashi and eight other assistants.